The final meeting of The Quilters' Guild of NSW Inc for 2010 is set for 1pm, Saturday 4 December at Burwood RSL. Come along to hear Dr Annette Gero's presentation about her 2009 Guild Scholarship research in Berlin on inlaid quilts. She helped curate, and to learn from, a major quilt exhibition in Berlin, which was the world first on woollen inlaid patchwork. In 2009, Alan Tremain received a $2,500 scholarship from The Quilters' Guild of NSW Inc. to contribute to the cost of his visit to USA earlier this year. As documented on his application, Alan’s main aims of the scholarship were to finalize practical applications for a quilt conservation, restoration and preservation thesis, knowledge acquisition to create a feasibility study for the establishment of an independent national quilt judging standard, and to observe and document quilt museum management, storage and exhibition principals. 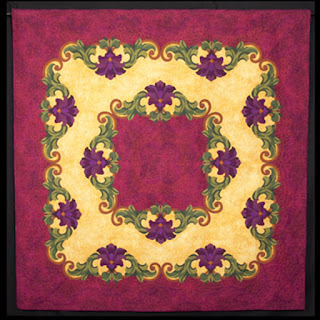 He wanted to interview prominent quilters as well as those involved in the historical preservation of quilt history like the creators of Mormon Trail Centre in Nebraska. As well, his aim included reintroducing Australian Quilt making to key museums, institutions and resource centres in America thus fostering greater exchange and interaction between our guild and exhibiting museums and quilt groups throughout the USA as we approach our 30th year. Alan's major purpose for the trip was to attend a nine day Nancy Kirk quilt restoration workshop in Omaha, Nebraska. 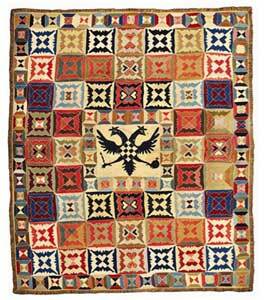 He researched and acquired quilts, quilt tops, fabrics and patterns with a focus on the American Mid West. He also wanted to view quilt collections held by individuals and in both state and local museums in his travels. 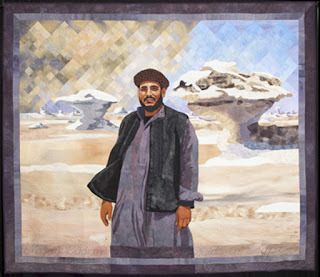 In the state of Nebraska, Alan spent time at the Durham Museum in Omaha, the Mormon Trail Centre in Pleasance, the International Quilt Study Centre and Museum and the University of Nebraska State Museum in Lincoln. He then travelled to Golden in Colorado where he visited the headquarters of Primedia, publisher of many quilt magazines, and viewed their QNL cover quilts exhibition, visited many historic houses, viewed a quilt at the Coors Brewery made from their ribbons and had access to some of the quilts in the Rocky Mountain Quilt Museum's archives by helping them move to a new location. With Judith Trager he was also able to view some private quilt collections in Boulder. When he visited nursing homes to track down old quilts and their stories from their owners, he was lucky enough to be given some quilt patterns, quilt tops and fabrics. Alan also took advantage of his time there to buy some quilts, quilt tops, Mountain Mist patterns, 1930s diecut quilt kits, cheater cloth fabrics from the 1940s to 1960s, quilt blocks and a number of feedsacks, all of which he showed us. We were very interested to see the crimplene quilt made from blocks of crossed tulips that was given to him by an 85 year old ex-dressmaker he visited in a nursing home. For those interested in increasing their knowledge of old quilts, Alan recommended the Barbara Blackman “Clues in the Calico” e-book, “Quilts of the Golden West” and the “Fabric Dating Kit Book” by Cindy Brick, and the Quilt Study books that have been published for each state in USA. For removing stains slowly in textiles, Alan uses the Herbon Prewash Stain Remover which is available from health food stores. Alan gave advice on the care, conservation and presentation of lace items, items of clothing, quilts and quilt tops that had been brought along by the workshop attendees. 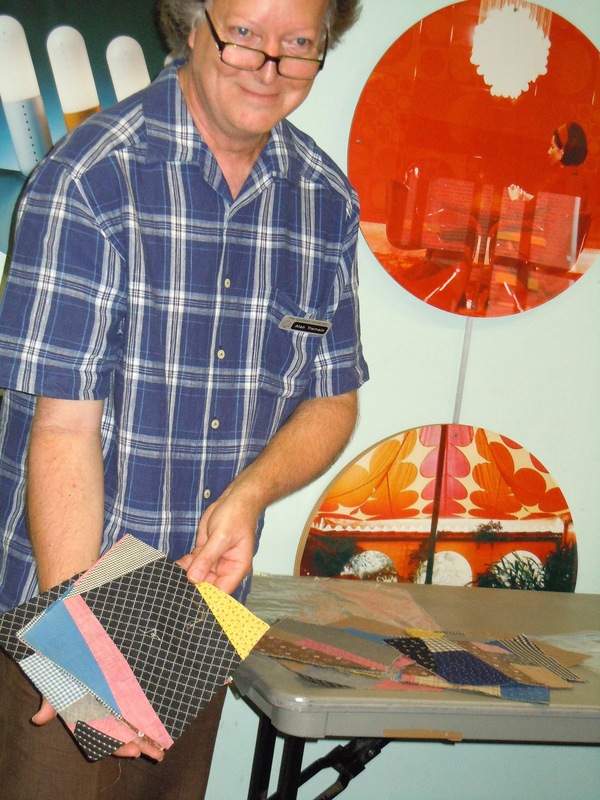 As a result of his trip, Alan has increased his store of research notes and photographs, and hopes to contribute to a national standard for quilt research. The December 2010 newsletter will be dispatched to members very soon. It's packed full of photos and articles including an introduction to the new committee; the striking array of quilts entered into the 2010 Guild Challenge; a selection of member quilts from The New Quilt 2010; quilts from Sydney quilt show guest exhibitor Gai Haines and more! 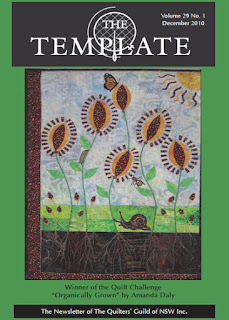 The first newsletter for 2011 will be distributed in early February (rather than March) so that quilt show entry forms can be posted out at the same time. Accordingly, the deadline for articles and advertising has been brought forward to 8 December 2010. The newsletter editor always welcome articles and news items from members. Similarly new advertisers are welcome. We accept colour advertisements in high resolution (300 dpi) jpg format. A 20% discount applies if you take out an advert for 4 consecutive editions. Please contact the Publicity & Sponsorship Officer to place your advertisement. For more information, also see the Guild's Advertising Brochure (285KB pdf). Southern Cross Needlework and Quilting Quilt Show at Clevedon House East Gresford (Hunter Valley) on Sunday 21st November. 9am to 2.30pm. Gresford is about half an hour from Maitland. The owners, Belinda and Ellis Richards hold community markets in the grounds of their historic house for the benefit of the community. We will be having quilts from Cessnock, Singleton, Maitland and Newcastle on show. Techniques will be mixed. Those attending last year were very surprised with the quality on show. There will be other stalls Devonshire teas and a BBQ on the day. The beneficiaries will be the Gresford Preschool. Congratulations to Guild member Anna Brown whose work Bushwalk – Flora 4 was awarded runner up in the large quilt category in the One Step Futher contemporary quilt exhibition presented by Victorian Quilters. Other Guild members whose work was juried into the exhibition include Jan Frazer, Dianne Firth and Brenda Gael Smith. The exhibition continues until 17 December 2010 at Whitehorse Art Space at Bx Hill, Victoria. Caroline Sharkey travels to many places to experience the colours and shapes of the Australian landscape. The Textured Landscapes exhibition opens at the Nexus Gallery in Bellingen at 5pm on Sunday, 14 November and continues until 9 December. This exhibition is all new work and has an abstract textured theme that Caroline has been developing into her work. Her inspiration comes from the landscape, the yarn and fabric that she paints, embellishes and changes to produce stunning examples of colour and design. Caroline works from her studio in Urunga, New South Wales. She has regular exhibitions in Central Australia and has been artist/craftsperson in residence with Ayers Rock resort at Uluru for the past 10 years. Caroline is also a generous sponsor of the Sydney Quilt Show and regularly donates framed textiles works for the Hangers' Prize which go both to the quiltmaker of the quilt voted as favourite by Guild volunteers on show set up day and a set up day volunteer whose name is randomly drawn from the roster list. 4 November Update: the complete IQF 2011 Winners Gallery is now online. Mariya Waters won a second prize and Jenny Bowker won a Honourable Mention for Sandstorm over the White Desert. Many thanks to our faithful correspondent on the ground in Houston, Lisa Walton, who reported on this exciting news. A new Guild management committee was appointed at the recent annual general meeting. Their names and contact details are set out below or you can download a copy of the 2011 committee directory (35KB PDF) for your records. Thank you to these members for donating their time, energy and enthusiasm for the benefit of our Guild.